Click the album for the short story. Attention: my advanced vehicle suspension relies on the flexibility of part joints. It will not work with Kerbal Joint Reinforcement enabled. Atypical because the CoL is ahead of the CoM. This helps taking off from water. It’s also the reason the engines are on top of the wing, they tend to push the nose down. It also helps when landing on water, use 30% throttle and switch to reverse when the loading ramp starts hitting the water to ease to pitching down. Very easy to fly, take off and land, never loss of control. It has enough pitch authority to handle a wide range of CoM shift. When on the ground you’ll see the landing gear assembly bend through the landing pods. It’s not pretty but it’s intentional. Better bend than break. 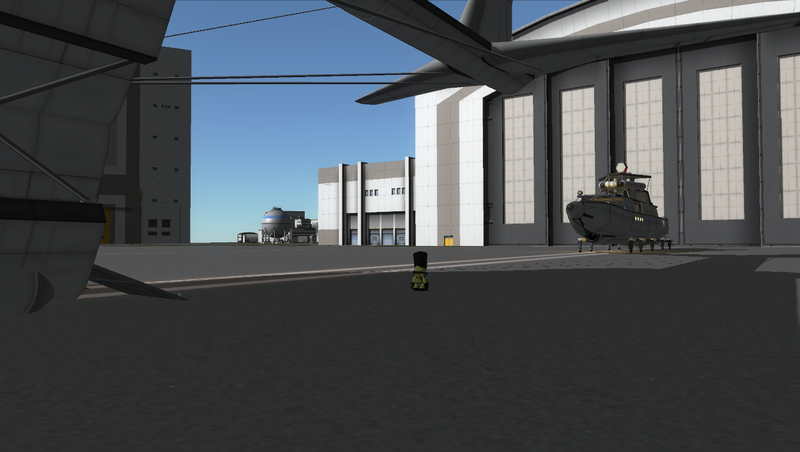 Loading/unloading cargo: keep the landing gear near the loading ramp down. Raise the rest of the gear. After raising, retract the rear gear with AG5. Mass with tanks full: 291 tons. Max loaded take-off mass from water: 404 tons. Minimum landing speed: 40 m/s. Minimum take off speed: 43 m/s. Minimum landing speed: 60 m/s. Minimum take off speed: 65 m/s. Max descent rate when hitting water: 2.5 m/s. Will climb unloaded, full tanks with throttle at 24%!